Lee Bradbury saw his recent work to revitalise the Hawks squad pay off with a 3-1 success against Boreham Wood on Saturday. The manager made the decision to freshen his squad up after a poor run over Christmas. He saw the new arrivals make a good impact as the Hawks got their second away win of the season in the Vanarama National League. Matt Paterson, in his third spell at the club, set things in motion with his ninth-minute opening goal. New Loanee defenders Chris Robertson, from Swindon Town and Jack James, from Luton Town, also made impressive debuts. The precious three points moves the Hawks up to 18th spot, three points above the relegation zone. Bradbury rated it a good team performance. He said: ‘It was a very good win and the result of a hard-working performance. ‘Not only did we battle hard but also showed good quality. ‘We got our noses in front and they threw the kitchen sink at us for about 60 minutes to be fair. The Hawks and Paterson made a dream start opening the scoring after only nine minutes. A clearance at the back post ricocheted back across the face of the Boreham Wood goal. It fell perfectly for Paterson who had the simplest of jobs to tap the ball into the net. Eight minutes later the Hawks fans were pinching themselves as the visitors doubled their lead. The home side conceded a free-kick just outside the area for a foul on Wes Fogden. 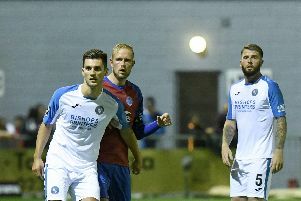 Andreas Robinson stepped up and curled a stunning free-kick over the defensive wall and into the top corner of the net. Boreham Wood threw everything at the Hawks in a bid to get back into the game. Solid defensive work kept them out until the 70th minute when the hosts reduced the deficit. Sorba Thomas drove his shot across goal for Idris Kanu to place home at the back post. It set up a tense finale but the Hawks sealed their win in stoppage-time with a quick counter-attack. Rutherford was felled in the penalty area and though his spot-kick was brilliantly saved substitute Hassan Jalloh slotted in the rebound. Bradbury is hoping the Hawks can use their back-to-back league wins as the springboard to climb further away from danger. He recognises how important it is to back it up with another win against Dover at Westleigh Park in their next game. They also have the added incentive of wanting to beat Dover for the first time in four attempts this season.